Even as a bulk of the Indian consumer product goods companies grapples with the demonetisation of the Rs500 and Rs1,000 currency notes, and the low demand thereof, father-son duo Dhirendra Singh and Abhishek Singh of Vadodara-based Manpasand Beverages claim their company has registered the highest ever growth in the past six months. "Consumption in rural India hasn't stopped. Our beverages are priced below Rs10, and there has been no impact there. Rs500 and Rs1,000 denominations are luxury in these markets," remarks Dhirendra Singh, CMD, Manpasand Beverages, which gets around 75 per cent of its revenue from rural, and tier 2-3 markets. The Rs557-crore company, which hopes to close this fiscal with a revenue of Rs803 crore, is gearing to double its volume growth from 1.7 lakh cases per day to 3.5 lakh cases per day (one case has 24 packs of juice). Rural has been Singh's focus ever since he launched the brand in the mid-nineties. The former ONGC employee recalls driving across states for days, observing retailer and consumer psyche in smaller markets and being convinced that there were abundant opportunities in these markets. Singh started selling Mango Sip in small towns and villages in Eastern Uttar Pradesh where brands such as Frooti and Godrej's Jumpin (which was taken off the market later) had a strong presence. Soon Mango Sip began to eat into their shares by offering higher margins to retailers. "Both consumers as well as retailers seek value in rural India. While they do buy big brands because they believe the quality is good, if a brand manages to offer both quality and higher margins, there is a natural attraction towards the latter," Singh states. 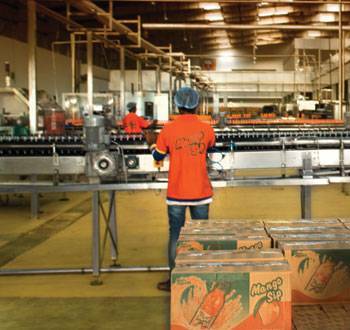 The makers of Mango Sip claim their global competitors such as PepsiCo and Coca-Cola have lost their fizz due to their largely urban focus and higher price points. "Our competition hardly operates in the Rs5-Rs10 price point, and that is the growing segment," points out Abhishek Singh, Director, Manpasand Beverages. Unlike most other beverage companies which largely have a franchise model, Manpasand has always believed that having its own production facilities is far more cost-effective. In the past 12 months, it has acquired land to set up production facilities in UP and Andhra Pradesh, and has increased the capacity of its plant in Vadodara, too. "We are the only beverage company to have nine factories," the younger Singh proudly remarks. The beverage maker plans to have at least 15 manufacturing facilities by the turn of the decade. The analyst community agrees that Manpasand's policy of having only company-owned manufacturing facilities has helped them exercise better control over costs and quality. In fact, Niket Shah, Vice-President (Institutional Research), Motilal Oswal Financial Services, says that the company's ability to keep its overall cost structure low has significantly helped its profitability. Apart from having its own manufacturing facilities, the company has also managed to keep its employee costs relatively low by not making expensive hires at the senior and mid-management level. Even at the entry level, the company believes in hiring from local universities and professional institutes, rather than from top ranking business schools. Besides, the company's advertising and marketing spends are significantly lower than that of competition. "Our brand ambassadors are our distributors, and we prefer to invest in them rather than indulging in extravagant marketing and advertising spends. Even when it comes to hiring talent, we take references from our distributors," says Abhishek Singh. Manpasand Beverages's moment of fame came in 2014, when it launched its carbonated beverage brand Fruits Up, which has 11 per cent fresh fruit extracts (unlike most carbonated brands which merely have 1-2 per cent fresh fruit extracts). This brand was launched just a day after Prime Minister Narendra Modi called upon soft drink companies to increase the fruit content in their beverages so that farmers could benefit from it. "I had been working towards creating a caffeine-free, fruit-based aerated beverage for two years. It was sheer co-incidence that my beverage entered the market just a day after Modiji talked about increasing the soft drink content in aerated bever-ages," says the older Singh. Fruits Up, launched just two years back, already contributes around 20 per cent to Manpasand's revenue. Even though the product was first launched in the rural markets of Godhra in Gujarat, Manpasand entered modern retail stores through this brand. Priced at Rs15 for a 250 ml PET bottle and Rs40 for a 600 ml bottle, Fruits Up competes head-on with the carbonated fruit-based beverages of Coca-Cola India and PepsiCo. Shah of Motilal Oswal Financial Services believes that the next wave of growth for Manpasand Beverages would come from Fruits Up as it appeals to both urban and rural consumers. "Fruit-based aerated drinks are the future, and Manpasand has the first mover advantage. It will become larger than Mango Sip," he says. Back at the headquarters, in the outskirts of Vadodara, Singh is chalking out plans of backward integration. He wants to foray into agri and fruit processing. His son, on the other hand, is planning inroads into rural markets. "Out of the six lakh Indian villages, only one lakh contribute to consumption. One can definitely stir demand in the remaining five lakh villages by coming up with suitable products," says Singh junior. His idea is to come up with juices in the Rs2-3 price point. The Singhs' ambition is to make Manpasand a Rs5,000-crore company five years from now and up its market share in juices to 20-25 per cent from the existing 10 per cent. Cheers to that.